1984 – 1985 were the first years when I was exposed to heavy metal and I want to bless Defenders of the Faith by Judas Priest by being the first metal album to graze my ears. It made for a lifelong love with the genre and I am so thankful for it. It was very difficult for that music to trickle through the Iron Curtain, so only the most popular foreign acts (like Judas Priest, Accept, Iron Maiden and Scorpions) got any exposure in the old Soviet Union. But, honestly, I am not sure I would have been able to make time for everything heavy metal produced at the time, since Defenders of the Faith, Screaming for Vengeance, Breaker and The Number of the Beast were on constant rotation not yielding any space to anything else. I guess I was a close-minded impressionable youth at 14, willing only to stick to the guns I knew. In that light, it would be interesting to see what I would have thought of Witch Cross Fit for Fight had I had a chance to hear it way back. Alas, I doubt many among my old high school circle of friends heard of this band, much less possessed the album. So, the first chance to hear Fit for Fight comes only now when venerable Hells Headbangers reissued this Danish band’s only album of note recently. Produced in the same studio as Mercyful Fate seminal albums, Witch Cross has about the same sound on Fit for Fight. Alex “Savage” Madsen’s vocals are way out front of the music, with the rhythm section especially buried in some remotely sounding cavern. Witch Cross, however, are not about the occult. The sound is where the similarity with Mercyful Fate ends. On the opposite, Madsen’s high, ringing in the ears, boyish voice and noodling guitar heroism create the atmosphere of purity and naiveté, the days when metal was more about exuberance and less about grimness. True to their epoch Witch Cross lay down a number of NWOBHM anthems (Night Flight to Tokyo), heavier and more raucous attempts at thrash (Killer Dogs, Alien Savage) and some friendly comfortable rocking chugs (Rocking the Night Away), as well as macho Loverboy rockers (Fight the Fire). 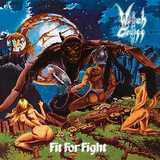 Witch Cross guitarists are not shy at attempting lengthy forays and somewhere at subconscious level you can even call some music on Fit for Fight progressive, making comparisons with Crimson Glory. There is even an instrumental here on the album in the form of Axe Dance. While some riffs on the album are absolutely touchstone pillars (Face of a Clown) and hookiness/catchiness of the chorus on Rocking the Night Away is suitable for a school dance, I have to admit that even if I heard Fit for Fight years ago, it would not surpass the aforementioned gems in my pantheon. Speaking of school dance and cross-gender appeal, Alex Madsen, sounding like a combination of Midnight, Geoff Tate and Klaus Meine, could have led a juggernaut heartbreaker if these songs were simpler in structure and included a ballad or two. Clearly, that was not the intent, and although commendably reaching for the weightiness, Witch Cross does not quite capture the masculine part of the audience either. Not without obvious merits, Fit for Fight would be relegated to the quality second tier in my mid 80s phonotheque, fighting for the spots in my collection next to, say, Saxon, who they actually also remind me of at times.